The purpose of the IndieGogo campaign is to raise production funds and generate brand awareness prior to the launch of the revolutionary home fitness machine, the VDIP Power Station. Abdon's VDIP LLC is excited to announce the launch of the highly anticipated VDIP Power Station IndieGogo campaign. The purpose of the IndieGogo campaign is to raise production funds and generate brand awareness prior to the launch of the revolutionary home fitness machine, the VDIP Power Station. The VDIP Power Station offers an innovative take on home fitness that combines the power of calisthenics and resistance training into an intense total body workout. 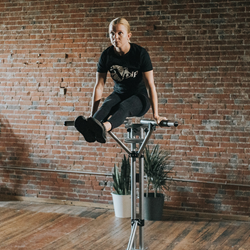 This machine creates a more challenging and effective workout from the comfort of the user’s home, with an extensive list of exercises including classic dips, backwards dips, leg lift pull ups, stationary leg raises, resistance band training and more. Inspired by fitness legend “Iron Guru” Vince Gironda, the VDIP Power Station was developed by Abdon’s VDIP LLC founder Abdon Placide after discovering the difficulty in achieving a V-shaped dip workout on traditional home fitness units. Since the product’s pre-launch promotions in 2017, the VDIP Power Station has received notable acclaim from fitness enthusiasts including influencers such as Hannibal for King and Barstarzz. The VDIP Power Campaign was launched on January 15, 2018 and will conclude on March 16, 2018. The VDIP Power Station is currently available for pre-sale with an anticipated release date in Spring 2018. To view the IndieGogo campaign, please visit https://www.indiegogo.com/projects/vdip-power-station. For any additional information, please visit vdips.com or contact Abdon’s VDIP LLC press contact Olivia Garrison at olivia(at)creativeclickmedia(dot)com. Abdon's VDIP LLC is the developer of the VDIP Power Station, a revolutionary fitness machine designed to provide the ultimate full body workout from the comfort of your home. Join the VDIP Power movement by visiting vdips.com.